An energy storage system provider in the US was commissioned to build a 40 MWh energy storage system for a key customer in the solar power industry. It was quickly determined that the customer could benefit from using an IIoT setup, which involves connecting various components of the energy storage system to the Internet. In particular, a system was designed to connect each battery in the system in such a way that engineers could monitor the temperatures of the batteries, as well as the current generated while the batteries are being charged and discharged. A detailed analysis of how turning relays on and off at different temperatures affected the amount of power being generated as well as the life of the battery allowed the energy storage system provider to optimize the algorithms used to control the charging and discharging of the batteries. In particular, the algorithm was tweaked so that relays were switched on and off (i.e., the batteries were connected and disconnected) at the optimal times based on the batteries’ temperatures. 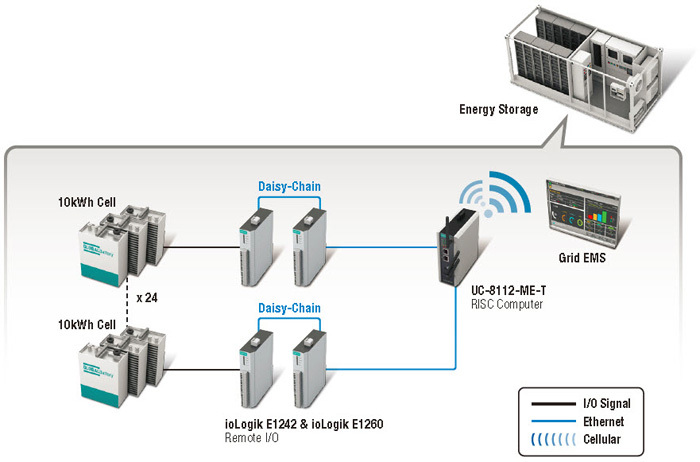 The ioLogik E1242-T and ioLogik E1260-T remote I/O devices with built-in Ethernet switch, and the UC-8112-ME-T wireless-enabled DIN-rail industrial computer were the best fit for this project. The ioLogik E1242-T’s two DI channels were configured to monitor relay positions, and its two DO channels were configured to turn relays on and off. Each of the ioLogik E1242-T’s four AI channels were configured to monitor the current produced by a string of six batteries, and the ioLogik E1260-T’s six RTD channels were configured to monitor the temperatures of the six batteries. As an added plus, the compact, daisy-chain design of the ioLogik E1242-T and ioLogik E1260-T I/O devices, each of which has a built-in 2-port Ethernet switch, allows the ioLogiks to be embedded into the battery system without adding an extra unmanaged switch. In addition, the UC-8112-ME-T industrial computer was configured to log data from the ioLogik E1242-T and ioLogik E1260-T. The system provider can retrieve the data from the UC-8112-ME-T at any time and then use the data as an aid in determining the best charging/discharging methods. All three products have a wide operating temperature design, which provides an added benefit since the system provider can use a cost-effective airflow cooling system instead of an expensive HVAC system.